Its name conjures up images of secret hideouts, sinister plots, and dastardly deeds. 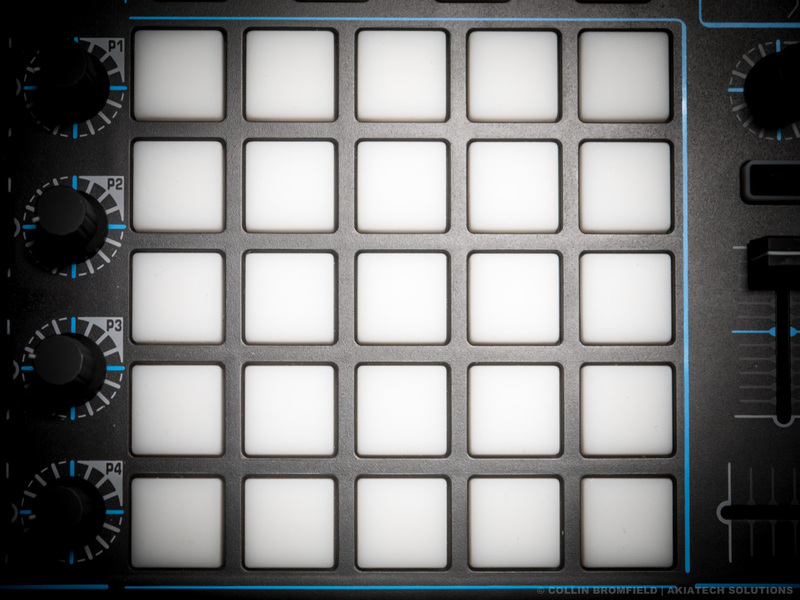 Its design is a cross between a Novation Launchpad and a Rii Mini, and its support framework is practically nonexistent. The conspiracy also features a design that unfortunately only a mother could love. I can’t knock it too much, though, this device is definitely the definition of “Function over Form”. I think Samson set out to design a competitive product that would appeal to a variety of individuals, and for the most part, they succeeded in this goal. There are compromises though and also a few oversights but in the end, the Conspiracy does in some way atone for its misdeeds! I had to copy and paste all that info, too much for me to type on a Friday morning. Oh yeah and Friday the 13th no less, this review seems very appropriate. Okay, so now that you see what the device has to offer you may be thinking that it must cost a lot of money. The good news is that it doesn’t. When It was originally released a couple years ago it retailed for about $199. Since it now qualifies for antique status you can get it for as little as $69.99 (Jan 2017). This is the only reason why it’s sitting on my desk at this very moment being reviewed for your reading pleasure. The Samson Conspiracy is a confused device. 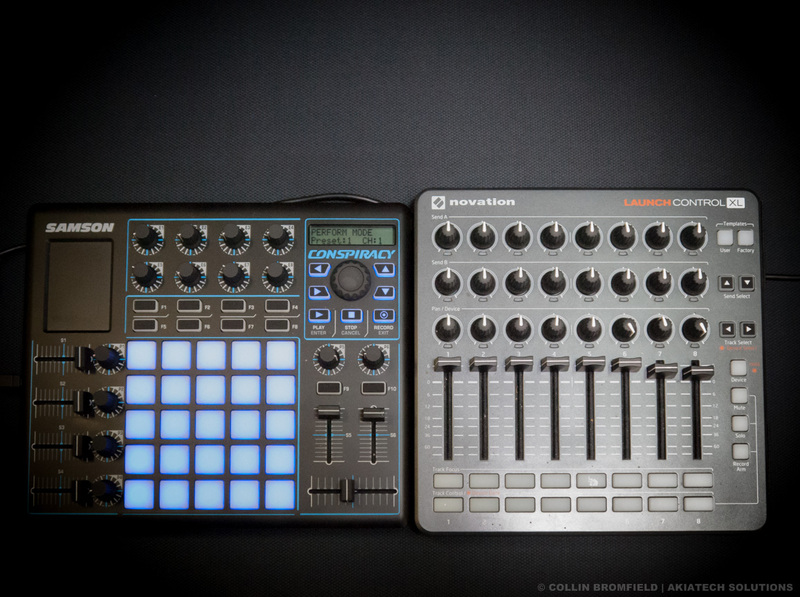 It wants to be a Drum Pad Controller, Clip Launcher, DJ Controller and DAW Control Surface all at the same time but fails miserably because the pads are too small to finger drum effectively, there are not enough buttons to launch clips, no jog wheels, and it provides only basic transport controls. For someone who has one of the aforementioned devices already but would like a few extra buttons or knobs the Conspiracy may then become an attractive option. Even though it will never be the star of the show, the conspiracy makes for a very good fluffer. I read a few reviews prior to purchasing the device and the majority of them were less than favorable. I being a tad bit overconfident in my technical abilities dismissed the reviewers as non-techies and figured it would be a piece of cake for me to get this thing set up. I was wrong! The packaging of the conspiracy is as minimalistic as it gets. The only items in the box aside from the controller were the user manual and a USB to Mini USB cable. I can see that all expenses were spared when they brought this product to market. After unboxing the device I figured since it was plug and play it would do just that but for some reason it did not. To get it to work I had to swap the cable and then plug it into an adjacent USB port. Once it was detected in the Windows Device Manager the next step was to upgrade the firmware to the latest version. To Samson’s credit, they packaged all the documents, firmware, and editor into a single zip file on their website so it was easy to access everything that was required for installation. 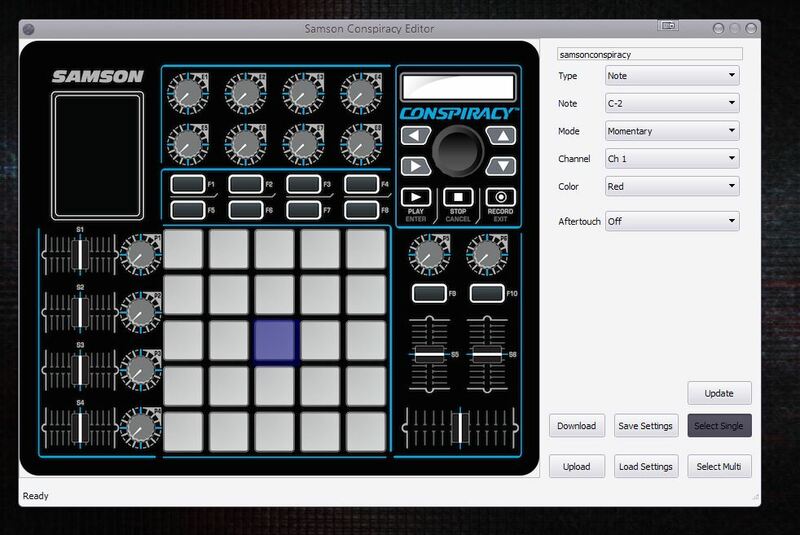 By default, the Conspiracy’s buttons are set to transmit MIDI Notes but many DAW’s require CC Messages. 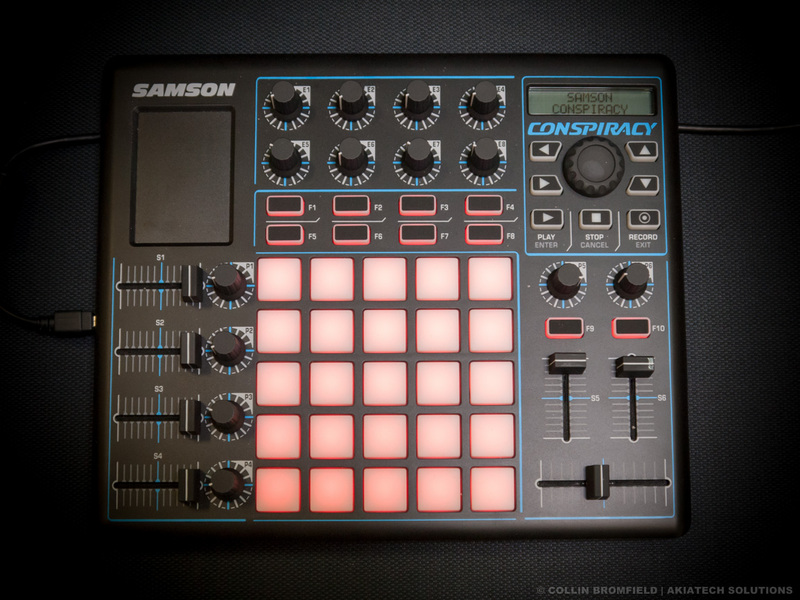 This was pretty easy to do without a computer since the Conspiracy has support for Presets, so you can create up to 20 with or without a PC by using the Samson Conspiracy Editor or the built in menu system via the unit’s LCD display. Initially, I could not get the editor to work, on my computers and most other Windows PC’s, the download folder is located in the user profile folder (The one with your name). Based on my testing, for some reason, if the editor is not extracted to the root of the drive it will not work. I could not get the editor to detect the Controller even though it was being detected by windows and other MIDI software. Only after relocating the folder to the root of my drive was I able connect to the controller and upgrade the Firmware. The User Manual said that you could use the editor alongside other MIDI applications to access the unit simultaneously in Windows 10, but this did not work for me, so each time I needed to edit a button or knob I had to close out my DAW. This was a pain for testing configurations in real-time, but eventually, I got it where it needed to be. Once the unit is configured you can always make on the fly changes using the built-in display and menu buttons. Once the conspiracy puts its mind to something it actually does a pretty good job getting it done. After struggling over the hurdles of configuring the editor to recognize the unit and setting up a custom preset, I was able to open up my DAW and configure the unit the way I wanted to. After I got everything situated, I launched a few instruments to test the capabilities of the unit. I have to say that I was impressed. Everything worked, the sliders slid, the knobs turned the XY Pad scrolled, the velocity sensitive buttons sensed pressure and aftertouch. All was good in the world. 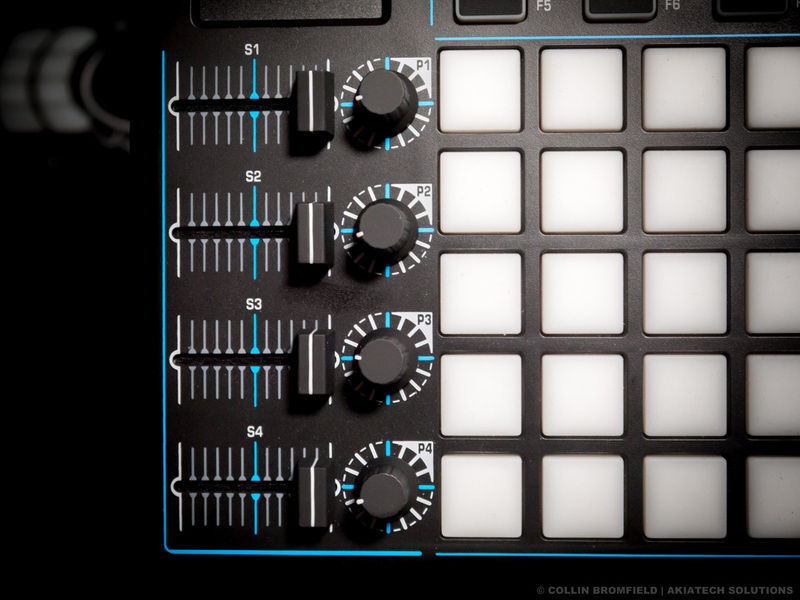 If you are a finger drummer or someone used to mashing away at a Launchpad or Ableton-centric controller, using the Conspiracy should be a breeze for you. If your synapses don’t fire very quickly, like mine, you may have a little trouble hitting buttons you don’t intend to. If you’re flexible with your music creation requirements that may not be too much of a problem but if you are trying to precisely hit specific notes every single time it’s best to start practicing, you will need it. One gripe I have with the Conspiracy is that the encoders are not the best. They turn smoothly, but every few turns they spike. So after performing some automation I had to go back and remove the “spikes” so that I could get a smooth line. Another gripe is with the pad bed. When you press and release a pad it sticks for a few milliseconds it’s not too bad then you are drumming slowly but it may throw you off a little when you press the pads in quick succession. To be fair this is something that affects other controllers as well but the pads on Novation and Akai units that I have used don’t have this problem. Lastly, this controller has button LEDs that I have yet to figure out how to control. You do get a nice flash when you tap a button or pad and you also have the ability to customize most buttons with your choice of a red, green or blue backlight, but as for having your software activate the LEDs, there are absolutely no instructions anywhere. 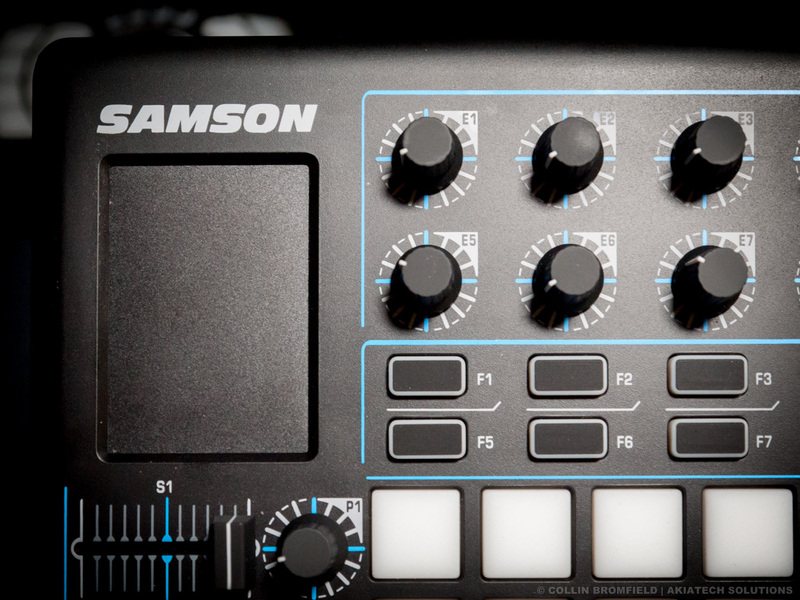 The Samson Conspiracy is not as interesting as its name purports it to be, but it is a solidly built controller with poorly developed software and drivers. If you can get past the fact there is practically no information or online help out there for this product you will feel comfortable knowing that it is actually worth what you might end up paying for it as long as you spend less than $100. As for reliability, I don’t know yet, but I have a Samson Microphone that I’ve been using for over two years now that is still going strong. I think Samson is sleeping on this controller and with better support could have dethroned a few market leaders. Things like a TSI for Traktor a Script for Ableton some MIDI mapping templates for the buttons and LED’s all this could be accomplished by a single employee in less than a month. Hardware isn’t everything, helping your customers help themselves goes a long way to improving the quality of even the crappiest device. If you want to charge premium prices for a device you better make sure that the competition is not on their A game because at the end of the day, poor support leads to poor adoption which then leads to poor profits and wasted potential. I probably won’t purchase another Samson product for now but I’m definitely keeping my eyes open for anything interesting they release in the future. What’s the deal with this Vegas Mode thing? You can’t have a device go into Vegas mode while it has an active data connection, all the devices I’ve seen with this feature activate it only when there is power to the USB but no data. Why would a company introduce a feature that requires someone to reactivate the device in the middle of a performance? I like the pretty lights but it’s an unnecessary feature at least in its current implementation. Please, Samson, spend a few bucks and release some new firmware, a TSI an Ableton Script and maybe one or two tutorials. Your customers will thank you!